Some of our contributors have become our best friends. We love you, baby, and want to play with you in and on our pages. But, there are a few things you should know first. 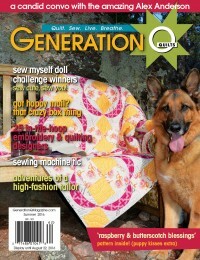 As a lifestyle publication, quilts and projects are just some of the many features we include in our pages and on our blog. 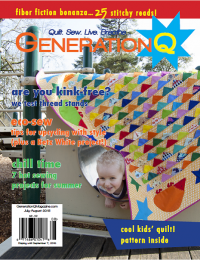 The number of original designs, called Playdates, varies in each print/digital issue of Generation Q Magazine. And we regularly publish smaller Playdates on our blog. We like a wide range of styles, and most can be described by one or more of these adjectives: fresh, modern, urban, contemporary, simple, clean, graphic, bold, unique, fun, hip, improvisational, funky, asymmetrical or innovative. We are not looking for country, reproduction, straight traditional or primitive designs. And it’s the same with fabric. Our readers like playing with something a little (or a lot) different. And we love Playdates with a sense of humor. Make us laugh and we’ll bug you for more forever! We might feature original Playdates using upcoming fabric lines, but we’re careful with how many. 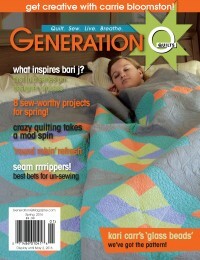 When fabric is no longer around for a featured quilt, our readers get a bit testy. If you’re sending us pics of an already-sewn project, please be sure you’ve jotted the collection and designer names of the dominant fabrics in the project. (We want to give credit where it’s due.) If it’s a scrappy stash-busting project, then don’t sweat it. 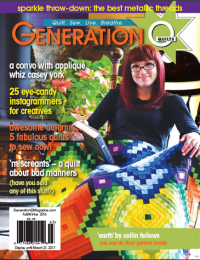 Now, at 7” x 9”, the printed GenQ is smaller than most craft magazines because we want it to be easy to lug around and show off. Because of this we don’t have pattern sheet pullouts. Templates are posted for all of eternity on our website. 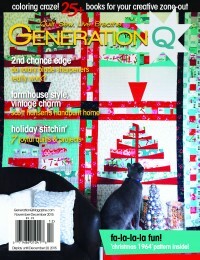 We’re open to all quilt/sewing techniques and skill levels, as long as the other criteria are met. The one thing all of our Playdates have in common is fabric, so we’re open to out-of-the-box projects as much as we want your quilts, tote bags, skirts and pillows. Do we even need to say that your submissions should be your ORIGINAL, UNPUBLISHED designs? If your project’s been on your blog or showing itself off on Flickr, it’s not automatically rejected, but we need to know. If you were influenced by a design you saw elsewhere and you’re giving us a variation, you need to tell us. The last thing anyone needs is to step on someone else’s copyright. We do ask that you write the basic directions, but we’ll rewrite them into GenQ style. If your Playdate needs illustrations, just give us something rough, but readable, and we’ll take it from there. And never, ever, ever tease us with a design that’s waiting for an answer from another publication. Playdates need to be in our hands about four months before the magazine hits the newsstands. Email us your ideas, sketches or pics. Please don’t send the actual sewn project unless we’ve talked. We try to answer queries within several weeks, but too much work and too little time can bog us down at times. You have our permission to nag us if you haven’t heard from us in a while. Please be patient though we’re a small company, doing multiple components, in multiple time-zones. We want to be flexible and fair with our designers but we also want to be able to continue to promote what we’ve done. We only hold the all-rights to your designs for six months after the newsstand on-sale date. But we’ll retain the reprint rights to the original Playdate as it ran in or on our pages forever and ever. We might one day use your Playdate in a special magazine or promotional materials and if we do, we will ALWAYS credit you and do our best to let you know what our intentions are with your design. And after the six months is up, if you want to rewrite the pattern into your own voice/style and whip up a new sample, you can go forth and market your own pattern versions while we cheer you on from the sidelines and brag about how we knew you when. If you write for us, you’re on the hook for the art, too, including getting hi-res images and writing captions. 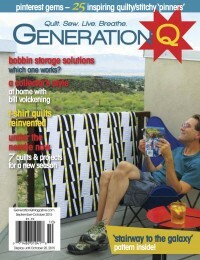 Any image published in Generation Q must be a high-resolution .jpg at least one or two megabytes in size. And we can’t use a Web image because it’s just too darn small for print. Also, your work must be journalistically accurate. (No-brainer, right?) To the best of our ability, all facts will be checked and you will be asked for notes or source lists to help with that. This protects you, us and anyone you write about. Email us your ideas and we’ll toss them around with you, and discuss deadlines and payment. We try to answer queries within several weeks, but too much work and too little time can bog us down at times. You have our permission to nag us if you haven’t heard from us in a while. If your work appears in the print version of GenQ or on our blog, we’ll send you a pdf of that issue’s cover—or a link to the actual GenQ blog post—so you can promote yourself (and us—thanks!) on your blog, newsletter or website. We’ll also include your links wherever appropriate on the website. Writers and designers get one copy of the magazine to drool over and flash to loved ones and strangers. We’ll also use all of our social media tools—Facebook, Twitter, Pinterest, emails, newsletters and more—to get the word out. And we’re happy if you return the favor. Thanks for wanting to play with us. Playdates should go to our Community Editor Teri Lucas at teri@generationqmagazine.com and article pitches should go to our Commander-in-Chief Editor-in-Chief Melissa Thompson Maher at melissa@generationqmagazine.com. Playdates are currently filled through our Winter 2016 issue. We are accepting submissions for projects for publication in 2017.